Just like news feed and timeline, Facebook introduced another new technology just in March 2013 and they named it as Facebook Graph search. It is a semantic search engine that provides well defined search results for users. Yes! Facebook graph search makes us easier to find out nearby places, restaurants and lot more. Not just that, it shows all your activity logs and anything everything that you searched in Facebook. Just like Google auto search, Facebook tracks all your activity logs and suggest the results based on your previous searches. How do you really feel when Facebook suggests awful, creepy and offensive results in search bar? This is a bit terrifying one, especially when you use Facebook in front of your co-worker or someone who is special. Here we will see how to clear Facebook search history. Facebook keeps every word that you type in search bar and this search history is private and can be seen only by you. Facebook provides high security, but anyhow don’t risk yourself by leaving your mobile or PC without logging out from Facebook account. Clearing all your search history is a good action if you’re really concerned on someone who digs your search history. 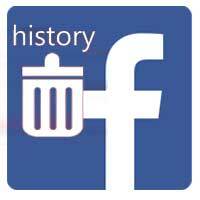 This simple guide tells you how to clear and delete all Facebook search history. View your profile timeline in Facebook and at the top right corner you will see Activity log that is just next to Update info. Activity log is the place where you can see all your Facebook activities and searches. You can find all your posts, photos, likes, comments, photos of you, photos you are tagged in, groups, events and search history. Now again at the top right corner you will see a box that says “include only me activity” which is unchecked by default. By checking this you are lining up your entire private activities and searches that are hidden from your timeline. Now explore more option from the right hand side and you can see all your activity logs in category base. In case if you are worried about any likes or comments that you made then you can easily find out and remove it from activity logs. So the main thing troubled you is the search bar history and we will now see on deleting your Facebook history. To clear history click on more that is next to photos, likes and comments. Now click on search at the beneath and you will see all your search history from the beginning. Again at the top right corner that is in search page you will see an option to clear search history. Facebook opens a pop box when you select to clear history and that is to confirm clear cache. It says “search histories are used to show most relevant results for you” and the final decision is up to you. If you wish so then click clear searches and you are done. You have erased all your search history and from now on the history page gets filled up again. You can delete all the history again after few weeks or months. Hope this post helped you on how to clear Facebook search history. Share this post and share your thoughts on this topic by leaving your comments below.